What was once tucked behind a large peninsula and walls, this Laguna Niguel kitchen is now an open, central part of our clients home. With the reworked floorplan creating the illusion of space, a large island was designed for both preparation space and for gathering around. Natural Taj Mahal countertops and a brown toned subway style glass backsplash bring warmth to the painted “Elemental White” cabinetry. The custom glass upper cabinets were strategically designed for size consistency. Amplified by the natural light from the large, sliding glass doors, this completed kitchen remodel is a crisp breathe of fresh air. 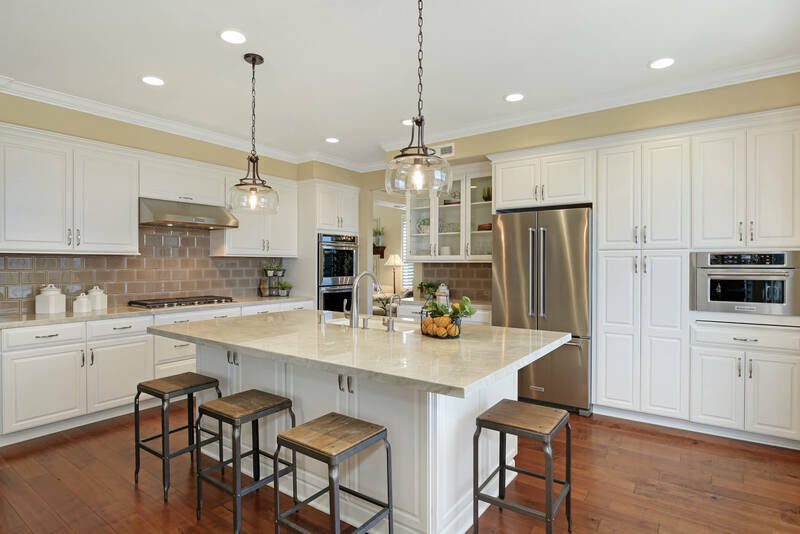 This drastic Laguna Niguel home remodel became this home chef’s dream. The large remodel encompassed an addition to the back of the home to allow more room for an enlarged kitchen and dining room. The new square footage also allowed for vaulted ceilings in the new dining room and a deck off the master bedroom on the second story. Our clients were looking for a chef’s kitchen and the final design included two large islands; one for food preparation and one for guests. 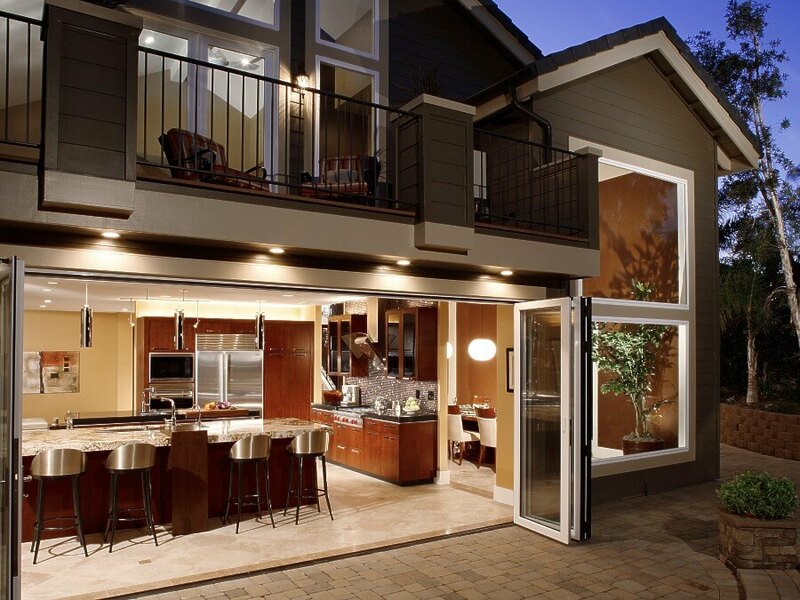 The project also included bi-folding doors that created one seamless transition from the inside to the outside. This modern home was transformed from a typical Orange County ranch home to an edgy retreat in this Laguna Niguel remodel. The project included full scale structural work: relocating a fireplace and removing/relocating multiple walls throughout the one-story home. The ceilings were vaulted throughout to create a large, open concept family, kitchen and dining space. Multiple sliding glass doors open out onto the custom deck to take advantage of a gorgeous gold course view. 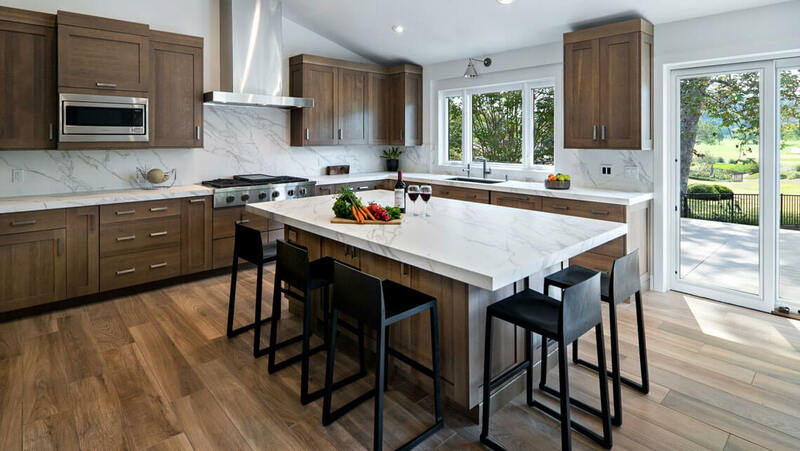 The new kitchen incorporates beautiful Carrera marble like countertops and a matching backsplash. Our clients decided on porcelain tile flooring that mimics wood throughout the entire house. This truly custom remodel created a comforting space while creating clean lines with a contemporary touch.